Today a colleague, the Rev. Klaas (“Clarence”) Stam, was buried in the sure and steadfast hope of the resurrection from the dead. We extend our sincere condolences to his widow, Margaret, his children, and grandchildren. May the Lord bless them in the days to come. I knew the Rev. Stam for many years and had the pleasure of working with him during my Ancaster time, 1997-2008. As we were the two senior ministers in the classis we were given the responsibility of bringing the annual visitations to the churches. In addition to the visitations, which were mostly pleasant, it was always an enjoyable week in May. We would leave Hamilton on Tuesday for Grand Rapids and after booking into a hotel we would bring the visit. Wednesday morning saw us drive to Chatham where we would again check into a hotel and bring the visit in the evening. Clarence would tell stories while I would drive and laugh. That got us into trouble on one occasion when I was laughing so hard I missed a crucial exit between Grand Rapids and Flint and we found ourselves well on the way to Detroit before I noticed. The only other mishap was one flat tire. Unfortunately it was raining. One of us got soaked to the bone. On Thursday we would make our way to London but not without stopping at a few good second hand stores along the way. He knew where they all were, and I have a few literary gems on my shelves to prove it. I remember one store near Chatham where I had found a small cache of old Bibles, hymnals, missals, and prayer books, which I collect. As I brought them to the counter Clarence told the young lady that she should not charge me for them because they were religious books and George was a minister. “Oh, ok,” said she, and I got them for free. Thanks, Clarence! After checking into a hotel in London we’d head over to Kerwood for the visitation. Friday we had a day to kill, which was good since London has many good used bookstores, Amitys and Sally Anns, and we’d hit them all. At one Amity or Sally Ann there was a painting that caught Clarence’s eye. It was for sale in a silent auction. Clarence placed his bid and when the young lady asked him his name and phone number in case he won (which he did, by the way), with a flawless French accent he said, “Clarence de l’Oiseau.” Back in the car, in the midst of my laughter, I asked him why he had given her that name. “Not sure,” was all he could come up with. Another thing we did together for a number of years was the radio broadcast, “What does the Bible say?” (Here is a link to an online article about it.) Our routine was to phone each other on Saturday afternoon, take ten or fifteen minutes to plan it out, and then spend an hour each Sunday evening in the studios of CHML on Main Street in Hamilton taking the phone calls and endeavouring to answer the questions. Since it was a call-in show there was not much to prepare for as the calls determined where the show went. As I reflect back on this I have wonderful memories of those evenings. There is a humorous angle to it when you think of two middle aged pastors both with multiple sclerosis keeping a weekly talk show going. When I left Ancaster for Ottawa in August of 2008 Clarence gave me a gift which I have always considered precious. 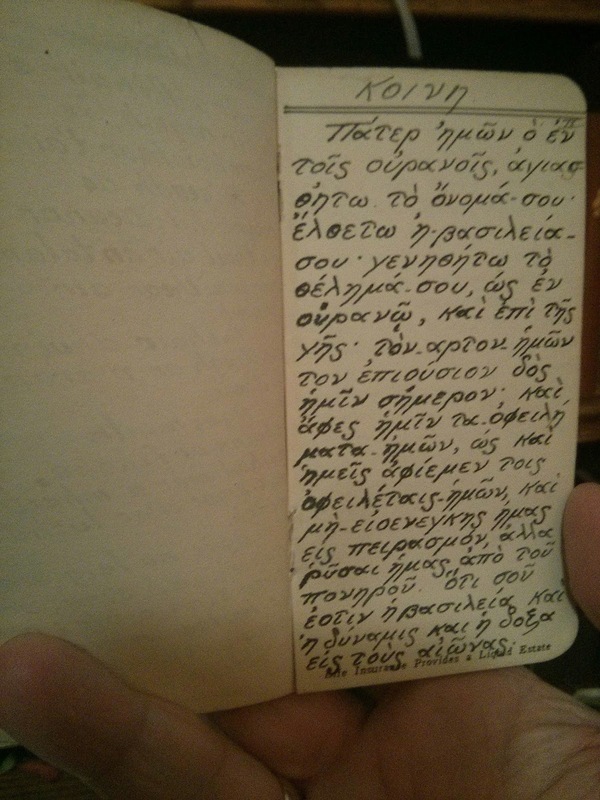 It is a small 2½” by 5“ notebook with a 1938 calendar on its back (please see below). The cover says, The Empire Life Insurance Company. 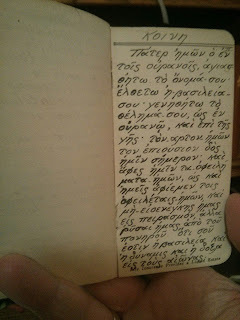 On the blank pages someone carefully wrote with pen and ink the Lord’s Prayer in twelve languages. 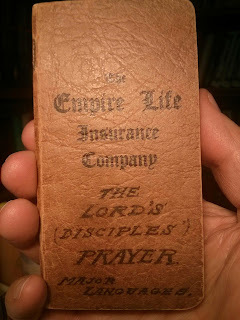 The Lord’s Prayer: ultimate life insurance for all the disciples of Christ! The earthly remains of Klaas Stam now lie in the ground. Barring the imminent return of our Lord, that is where we are all headed. Klaas was a great preacher, but even more important, he was a faithful preacher. For many years he faithfully preached the glorious gospel of our Lord Jesus Christ and called his congregation to watch and to be ready. Klaas was ready. May we all on the last day be found by our Lord eagerly awaiting him. Beautiful, George! Thank you for sharing those memories!